Given that this is our October issue, King Diamond seemed an obvious choice for a retro review. Add in the fact that he's one of three artists featured in the Halloween music article that is the print-exclusive in the book edition this time around, and it seemed obvious. When you also figure that the song "Halloween" is on this disc, how can you really go wrong? Perhaps this doesn't have as much of the theatrical texture or the purely classic nature of the later sets I've reviewed (Them and Abigail), but it's incredibly strong. This disc was clearly a necessary step to get to those masterpieces, and it just plain rocks. Rather insane keyboard textures with dark sounds added to the mix start this. As it works forward it drops to a more atmospheric movement for a spoken chant type section. The keyboards return to drive this forward with some classical music that is dark and horror film based. It is a couple minutes in before the real metal screams out driving the piece forward. The vocals come in over with style fulfilling the promise of the music. There are some almost ghostly chorale styled vocals in a later movement. This is drives forward with such style and finesse. I really love the guitar solo segment further down this musical road. This thing does not sacrifice any metal power to get it's drama and creepy style. The opening atmospherics here are packed with creepy vibes. The spoken vocal that comes across augments that. After this introductory section a killer guitar riff driven jam ensues. More of those chorale style vocals come over the top after a time. After that works through another riff driven motif enters to move this cut along in style. The vocals come in over the top from there, and we're underway in style. The guitar driven instrumental section later in the track is purely on fire. It works out to a different smoking hot riff from there. That mode makes me think of Iron Maiden just a little. Atmospherics start this piece, too. It launches out from there rather quickly into screaming hot metal. This is fiery and so classy. 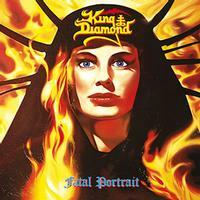 There are hints of things like Iron Maiden and Judas Priest here, but overall this is trademark King Diamond. It's also one of the most aggressive and powerful pieces of the whole disc. Again the guitar solo section is on fire. Pounding into being, they bring the metal right out of the gate here. This is purely aggressive and mean. It has some smoking hot guitar soloing built into it. An evil laugh at the end is a nice touch. Screaming hot heavy metal is on the menu here. This is classic real steel delivered as only King Diamond and crew can. The metal riffing that leads this out in purely classic. While there are some more melodic elements that come into play at times, this is really fire and fury in motion more than it is anything else. As always, the guitar soloing is particularly effective. This is just so mean and powerful. From the killer trademark King Diamond vocal performance to the meaty guitar sounds, this has it all and more. This cut is just about a minute and a half long. A weird introduction gives way to a fast paced, hard edged metal jam from there. This instrumental (other than some non-lyrical vocal bits on the intro) has an almost proggy edge to it. Smoking hot metal riffing brings this into being. It drops down to a more melodic break before powering back up for the entrance of the screaming hot vocal performance. That melodic movement returns here and there throughout this fierce ride. There are some definite progressive rock elements that show up in some of the over-layers on this cut. They don't sacrifice the metal fury for them, though. There are some definite theatrical parts late in the track. The screaming hot metal returns to bring this cut into being. This is particularly mean, but also theatrical and trademark King Diamond.